Sewline’s new permanent marker, the STAYER, has a fine nib point that is designed for marking on templates, stencils and fabric and will not smudge or bleed. 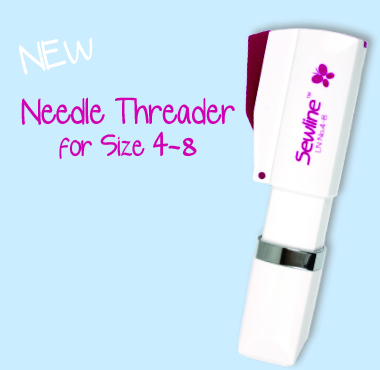 Our favorite Needle Threader is now available for larger needles too! This new design fits needle sizes 4-8. & a magnetic top to easily pick up those small needles. You can find these new Sewline products at your favorite local quilt shop! Are you familiar with the SEWLINE brand? Which products are your favorites? By Sarah CastanedaIn NotionsTagged Needle Threader, Sewline, Stayer Permanent Marker5 Comments on New SEWLINE ! very nice!! I have the Sewline Trio and really love it. Is the permanent marker OK to go through the wash? ie would it work for labeling? Thanks!